It’s that time again and I can feel the excitement as Xerocon is just around the corner and can’t wait to hear from some incredible speakers such as Sir Chris Hoy and Ben McBean, and also meet fantastic add on partners and hear all the latest news from the Xero team. Also it’s going to be a great trip away with 4 of my colleagues from the office so we can experience this together and enjoy a break away from everything vat/paye/self assessment/corporation tax related. I have of course been reflecting in the past few weeks on our own journey with Xero since we became partners back in 2013 and have since gone on to become Gold Level partners. 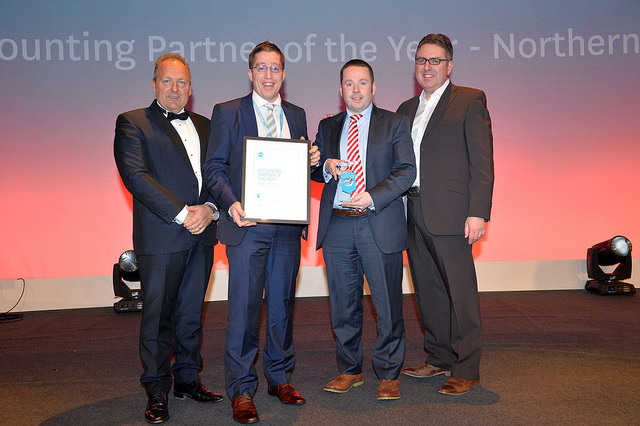 Nothing has topped though winning Xero Northern Ireland Partner of the year in 2015! It is my proudest achievement in business and one of the proudest of my life. There hasn’t been a Northern Ireland partner of the year since so I guess we are the inaugural NI partner of the year. What it has meant for me and the business cannot be underestimated as I am someone who hasn’t always had the confidence to back myself to the hilt. But winning that award really was a game changer for myself and for the business. It has given us so much confidence in our mission to provide great service to our clients and in our partnership with Xero, a truly great company to be involved with. · Networking with the leading accountancy practices in the UK – inspirational firms such as the WOW company, Kinder Pocock, Valued, Carpenter Box and some closer to home who are attending such as Cloud 360 Accounting and Cartwell Stewart– it’s always great to learn what they do best and then bringing that knowledge back to our own practice. · Learning about the latest software available for small businesses by meeting the many and varied add on partners with Xero – we already love Receipt Bank, Go Cardless, Futurli, Deputy, Auto entry and many more but it will be great to see what new innovations are out there and see if any are useful for our clients. · Hearing from inspiring speakers and listening to their stories about triumphing over adversity despite the many challenges they have faced such as Sir Chris Hoy and Ben McBean. I’ll never forget listening to previous speakers such as Karen Brady and Sir Ranulph Fiennes and their fantastic stories and words of wisdom, so this year will be great aswell. · And enjoying the Xero party of course! Anyway, I’ll be sure to follow after Xerocon of course with an update on the latest announcements. Though we may not win NI partner of the year again, I can always look back with admiration for our tremendous achievement in 2015. It’s good to know we and our clients are in great company with Xero and Xerocon will be another fantastic event.